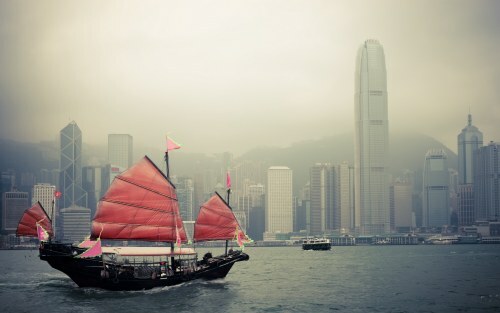 Hong Kong Airlines has dropped the price of their non-stop flights from Vancouver to Hong Kong down to $578 CAD roundtrip including taxes. A few weeks ago, Air Canada was offering an identical price on their non-stop flights from Vancouver to Hong Kong (those have gone back up). This time there looks to be availability in April and May 2018. 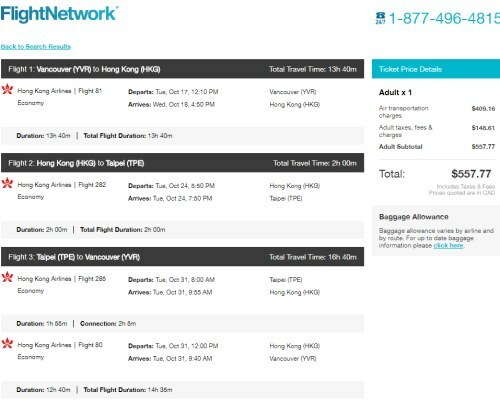 And Cathay Pacific (a 5 star airline) is offering non-stop flights from Vancouver to Hong Kong for $655 CAD roundtrip including taxes across a similar date range. Try this Google Flights search. Some intense competition to HKG at the moment! NOTE: If you're searching on Momondo, after your search completes, you may want to select 'non-stop flights' on the left hand side. (you can also reverse the order of Hong Kong and Taipei, if you want to visit Taipei first). Nov 24 to Nov 29 to Dec 6 -- new! Jan 10 to Jan 17 to Jan 24 -- new! Jan 12 to Jan 17 to Jan 24 -- new! Jan 16 to Jan 21 to Jan 27 -- new! Jan 19 to Jan 24 to Jan 31 -- new! Mar 2 to Mar 7 to Mar 14 -- new! Mar 9 to Mar 14 to Mar 21 -- new! They have been added to the list above. Look for the --new! dates. Update 10/23 - Non-stop flights from Vancouver to Hong Kong with Hong Kong Airlines are still available for $566 CAD roundtrip including taxes in November and the first half of December 2017. As well as January, February, March, April, and May 2018. 3. Try starting with a Wed to Wed date combination in the months listed above. Once your Flighthub search completes, try clicking on 'Non-stop only' on the left hand side. You can also click on the 'Flexible Dates' tab to see other date combinations that are the same price. You can also turn these into 2-in-1 trips and visit both Hong Kong and Taiwan for $543 CAD roundtrip including taxes in November and the first half of December 2017. As well as January, February, March, April, and May 2018. 4. As for dates to use, try starting with Mon, Tue, Wed, or Thu dates in the months listed above. Play around with the middle date to give yourself more or less time in Hong Kong vs Taipei. vancouver, yvr, flight deals, taipei, taiwan, tpe, asia, east asia, hong kong, hkg and hong kong airlines. 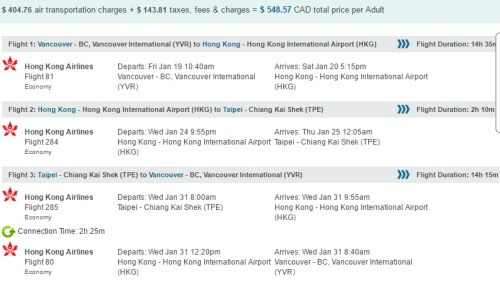 4 Responses to "Vancouver to Hong Kong - $548 CAD roundtrip including taxes | non-stop flights (or make it a 2-in-1 trip with Taiwan for even less)"
Tried booking, but can't book. good luck to those who can get it. had the same experience, was trying to book dates in March/April, flights were coming up as $620CAD on both Momondo and Skyscaner via Cheapoair but received a "sold out" notification after filling out all information and clicking "book". Immediately had someone from Cheapoair contact me regarding my incomplete booking and they told me that dates in March and April are no longer offered by Hong Kong Airlines. You may have better luck with earlier dates, good luck! LOVEEE!!!!!!!!!!!!!!!!! THANK YOU SO MUCH =D just booked my second trip using YVR Deals. I'm a faithful follower. Thank you Chris!! Excellent, I'm glad it helped, have a great time in Hong Kong!